Oil cooler is a device which is used for to cool the Service Fluid (Oil ).This type of oil cooler is used in Hydraulic Power pack and power pack used in all the machineries like Press , dredgers , Plastic Injection Moulding Machineries and No of other Hydraulic Systems.Oil cooler Constructed and Designed by ASME Sec VIII Div -1 and TEMA Standard. 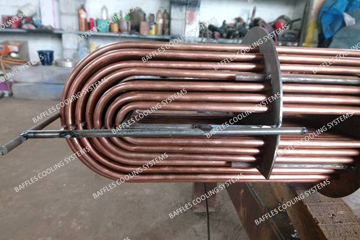 In these construction to achieve performance for reduce the heat from Hot Fluid.In Oil cooler, cooling medium used as Water, its clean and potable water or RO water used for cooling purpose. It may not be affecting corrosive the materials. Oil cooler Constructed and Designed by ASME Sec VIII Div -1 and TEMA Standard. In these construction to achieve performance for reduce the heat from Hot Fluid.In Oil cooler, cooling medium used as Water, its clean and potable water or RO water used for cooling purpose. It may not be affecting corrosive the materials. 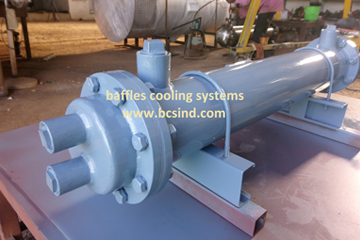 Oil Cooler have two sides is there; One is Shell Side and another one is Tube Side. In shell side, hot fluid pass in zig zag motion .We have to calculate the Oil velocity, Viscosity, inlet temperature and required Outlet temperature by use as per the Thermal design calculations .Meanwhile Tube side also calculated. In Tube Side, cold water pass in the Tubes. All the tubes will be seamless copper tube / Carbon steel tubes. Copper tubes better Thermal Conductivity compare than carbon steel. So quickly heat removed and performance achievable. 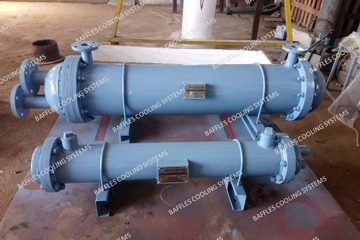 Oil cooler constructed by TEMA and ASME Code rules and we have specialised in Mechanical Design calculation.